In 1896 Paul Cézanne became a recognized painter but, always the object of the gibes of the journalists lampoonists and of the public, too much used to the pompous classicism of the medal-holder painters of the official Lounges. The success did not manage to dissipate its gloom, and only the Mas of Bouffan, family property of Aix en Provence, offered him the solitude to which he aspired. Letting, as often as possible, his wife Hortense and her son Paul live in Paris. But, suffering from the diabetes, he was forced medically to look after himself surrounded by his family. 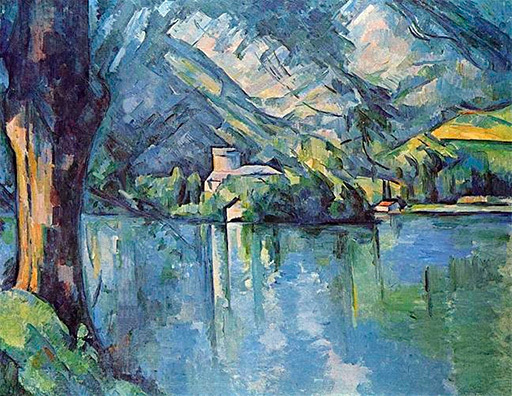 Tortured by his disease, forced by his relatives to look after himself away from his native beloved Provence, he was able to take a step back from this context to achieve on the banks of the Lake Annecy one of his most beautiful masterpiece : Lake Annecy, property of the Institute Courtauld of London; two paintings representing the child with the straw hat, respectively in the County Museum of Los Angeles and the Gallery Yoshi of Tokyo, as well as 21 aquarelles and drawings referenced Venturi-Rewald, today spread in the biggest collections of the world. Adrien Chappuis wrote in 1956 about him: "In the peace of its retreat, nature, pleasant and interesting, held him company; he, who usually did not touch brushes as soon as it had gone out of its native Provence, or the Ile-de-France, painted on the lakesides a famous picture. This picture shows Duingt seen from the banks of Talloires with the lake, the castle, the mountains... A branch of tree goes down in curve towards the right, masking the valley. The landscape is happy. The blue tones dominate there, with the green and the pink ".